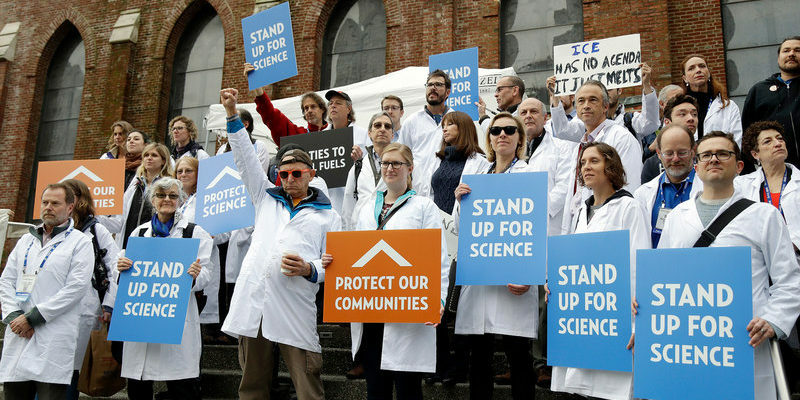 San Francisco, CA — April 21 Hundreds of US Environmental Protection Agency and NASA unionized scientists are joining the March for Science in San Francisco on Saturday, April 22nd to defend the science that powers their professions. The current attacks on evidence-based science – seen both in terms of proposed withdrawal of government funds and by favoring ad hoc opinion over scientific data – are putting the health and safety of our communities, environment, and economy at risk and have the potential to roll back decades of progress. As producers of facts and truth who provide the data and research needed to make evidence-based policy decisions, these scientists are dedicated public servants who are facing severe challenges to their scientific integrity. Their union, the International Federation of Professional and Technical Engineers, acts as one of the last lines of defense to allow them to execute their work without fear of retaliation from corporate or political power, and to uphold their responsibility to the public good. Of particular concern to potential public impacts is a proposed 31% reduction in federal funding and a 21% reduction in the workforce at the EPA. Doing everything from managing toxic Superfund site clean-ups to ensuring clean air and water standards compliance, as well as preventing the misuse of government funds earmarked for specific programs, professionals represented by the Engineers and Scientists of California Local 20, IFPTE are especially concerned that these cuts would cripple the agency’s ability to protect public health and the environment. Reduction in this workforce or the resources necessary to complete this work could lead to a return to a smoggy 1970s-era Los Angeles skyline or another Love Canal tragedy. “Our work saves lives, whether it is people with asthma or those who would be exposed to lead poisoning or cancer-causing agents in their drinking water. The EPA’s mission is to protect human health and the environment. We protect kids at playgrounds, anyone who lives near a landfill or industrial area, anyone who drinks tap water, anyone who breathes the air— basically every person in this country. Additionally, unionized scientists at NASA Ames are worried that improper political pressure and corporate greed could undermine their critical work, replace scientific data with alternate facts, and harm the American people for generations to come by corrupting government policy making with disinformation. IFPTE Local 30 represents all non-management workers at NASA Ames Research Center, including its scientists, research technologists, and aerospace engineers. NASA Ames unionized scientists contribute to most major NASA missions and initiatives. Represented employees include experts in advanced IT and autonomy, technologists focused on innovative new air traffic management systems, engineers developing small cost-effective spacecraft missions, and scientists engaged in space, earth, and life science research. In particular, NASA’s earth observation and analysis programs provide critical data that helps us better understand our planet and how it is changing, and supports of a wide array of societal benefits from national security planning to optimal water use for central valley farmers. IFPTE unionized Scientists will meet in front of a large banner in support of the EPA near the fountain in Justin Herman Plaza at the March for Science, and will continue after the March to fight for scientific workplaces free of political intimidation and funded appropriately to meet the needs of the American people in the 21st century. The Engineers and Scientists of California Local 20, IFPTE is a dynamic, democratic, and activist union that represents more than 6,000 engineers, scientists, licensed health professionals, and attorneys at PG&E, Kaiser Permanente, the US EPA, Legal Aid at Work, numerous clinics and hospitals, and other employers throughout Northern California.